I wish Election Day was tomorrow. That’s all I have to say about the election this year. I used to hate cooking with squash because I dreaded the cutting part. I seriously feared for my fingers and hand when I had to take a very sharp knife to a very hard item. I would always pray that a finger wasn’t a casualty whenever I pulled my knife out of the squash. And sometimes! The knife would even get stuck and I didn’t know how to pull it out. Seriously, scary stuff. I always thought that microwaving squash without piercing holes into its exterior would cause the entire thing to blow up (kind of like microwaving a potato without piercing the exterior). Well, since it’s only a few minutes, it’s not enough to cause your squash to implode. Life forever changed. You have no idea how many squash recipes I have made since this very wonderful tip. I don’t know why it didn’t show up on Google. Let’s talk about the filling. 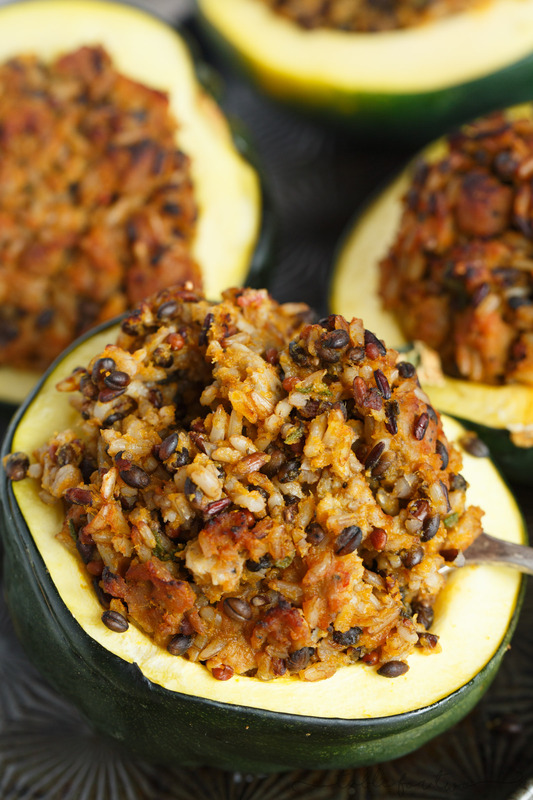 If you love the flavors of Fall, you will love the filling that is stuffed in these acorn squash. Oh my word, I could not stop eating the filling. I wish I made more than just enough to fill the squash. Seriously, it’s packed with Fall flavor and super hearty and filling. Fall is officially here. Get fillin’! 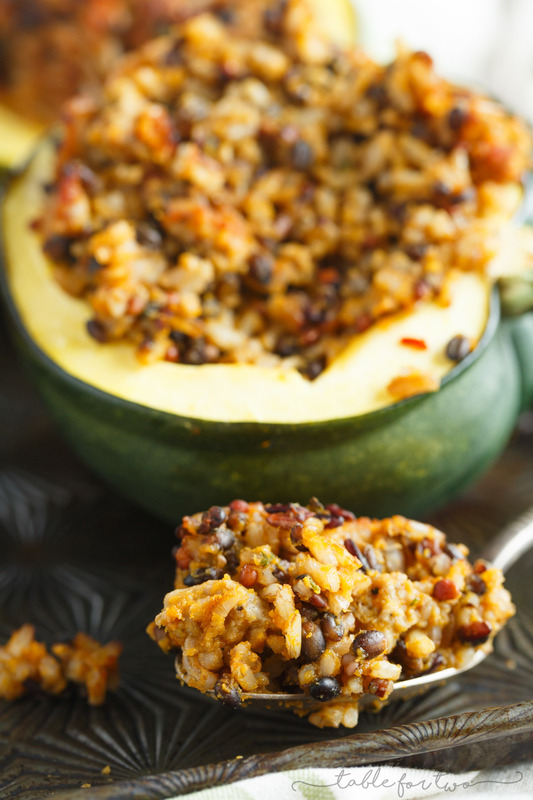 If you love the flavors of Fall, you will love this stuffed acorn squash recipe! Bring a pot of water to a boil and cook wild rice according to the directions on the bag. In a medium skillet over medium-high heat, brown sausage and break into tiny pieces. Add the chopped sage and cook until fragrant, about 3 minutes. Once the rice is done cooking add to the skillet and add pumpkin puree along with it. Stir to mix and incorporate everything. Season with salt and pepper. 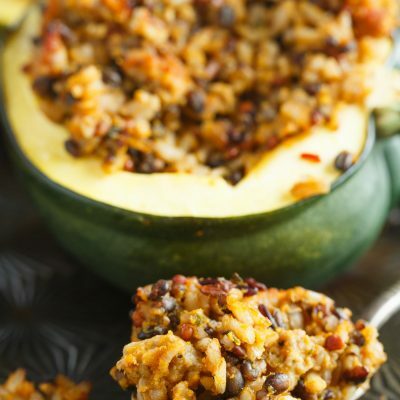 Evenly distribute filling into the squash cavities then place on a large baking sheet. 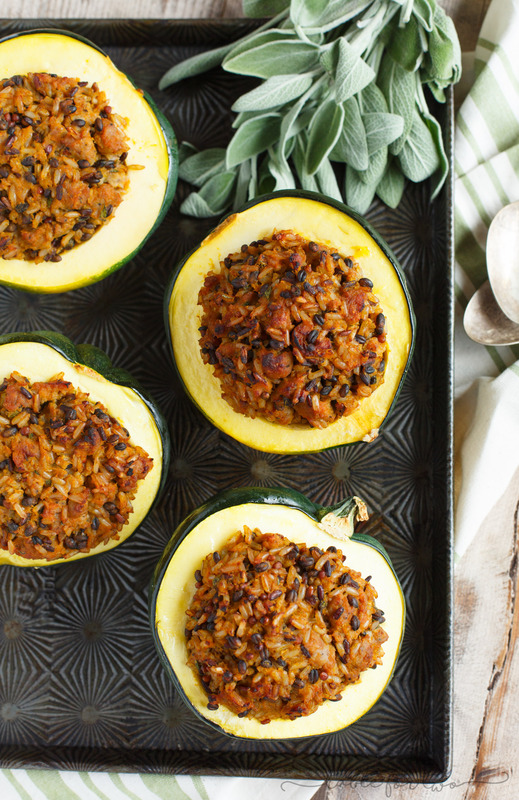 Bake in the middle rack of the oven for 30-45 minutes, or until the squash has softened and cooked through. If the filling starts to get too brown on top, you can cover the baking sheet loosely with foil until squash is done cooking. 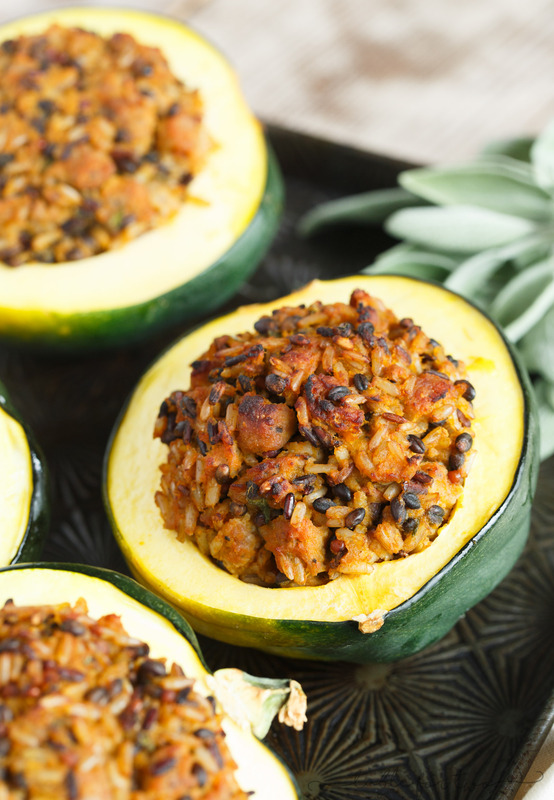 To easily cut squash in half, place squash into the microwave and heat for 3 minutes on high. Let cool and then slice in half with a very sharp knife and use a spoon to scoop out the seeds and membranes. If you cannot find the exact sausage I mentioned above at your local store, it's okay. Any apple pork sausage will work. I definitely recommend one with apples in it; it gives the dish a little Fall sweetness! There is an affiliate link within this post. MMMMMMMMmmmmm! Yes please, I’d eat them all! 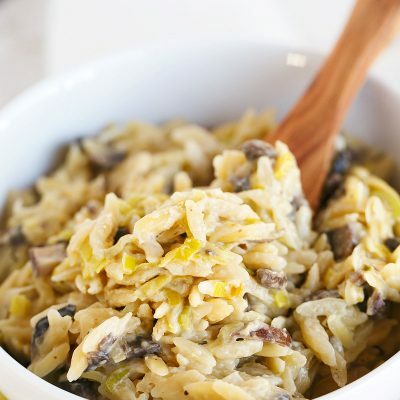 This recipe sounds so perfect for this time of year! 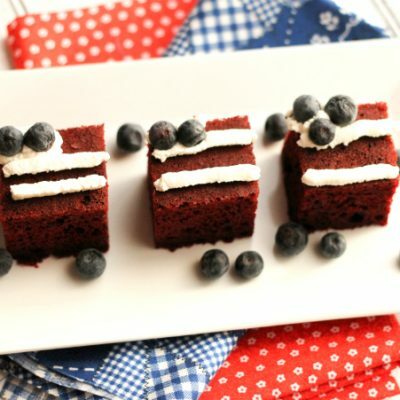 These look absolutely perfect Julie! Exactly something I would want to eat! I need to make this for dinner as soon as possible! Looks great. Oh, MY! 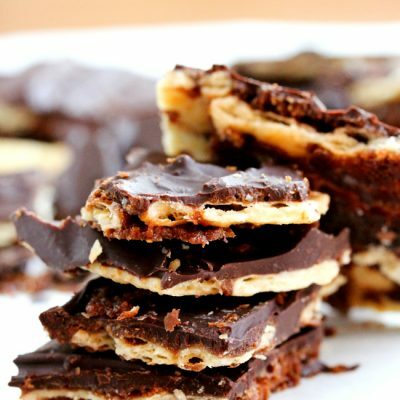 My stomach is growling from this recipe! It looks and sounds heavenly! Having my dinner in an edible bowl sounds fantastic!! Julie, this dish looks fantastic! What a great recipe for fall entertaining! So pretty! Anyone tried it without the sausage? We do not eat meat and wondered about just putting some applesauce into the mixture.